Sometimes it's better not to tempt fate (pun intended) and try to recreate an iconic pop culture moment. But, 1977's Grease had been so massive that it was only inevitable that Olivia Newton-John and John Travolta would team up for another movie together. What the tagline should've been: Listen to the soundtrack, don't see the movie. Big mistake. 1983's Two Of A Kind was inundated with Razzie nominations and the whole project was only saved by its soundtrack, which featured one of Olivia's best-ever singles - a song which debuted on the ARIA singles chart 33 years ago this week. Conversely, Billy Joel's musical recreation of iconic moments in pop culture history was proving to be incredibly successful, with his homage to Frankie Valli & The Four Seasons, "Uptown Girl", moving up to number 1 this week in 1983. Consider them as South Australia's V-Capri - Vertical Hold were massive in their hometown of Adelaide, but unknown pretty much everywhere else. 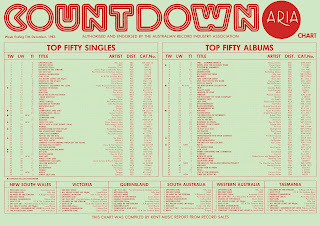 "Shot Down..." was the band's third and final top 100 appearance. Taken from Voice Of The Heart, the sibling duo's first album following Karen's death in early 1983, this version of a song released by Bobby Vinton in 1979 had originally been intended for previous album Made In America. A slight improvement on the peak achieved by "Decisions", but still a chart disappointment for the Sydney band. None of their further releases, either single or album, made the top 100 after this. Odd one out time - "Magic" was the only debuting song this week not to make the top 5, despite the fact that Dragon's previous single had reached that section of the chart and this follow-up was another great sing-along pop/rock track. What's even more puzzling to me is that, like "Rain", "Magic" was not yet available on an album, with Body And The Beat (which contained both singles) not surfacing until mid-1984 - so there really should've been no excuse for people not to snap this up. Other than, you know, spending their money on Christmas presents. Here's an artist who had better success following up a massive hit, with Irene Cara's non-soundtrack release "Why Me?" becoming her third top 5 single in Australia. Like "Flashdance... What A Feeling", "Why Me?" was co-written and produced by Giorgio Moroder, who was behind a large chunk of Irene's What A Feelin' album. Despite being a big hit locally, it's pretty much been overshadowed in the decades since by her contributions to the Flashdance and Fame soundtracks. Tomorrow, filming is set to begin on the long-delayed Olivia Newton-John biopic, with Delta Goodrem starring as Australia's first internationally successful pop princess. And if any song was calling out to be covered and released to coincide with the project, it's this track from the Two Of A Kind soundtrack. Like "Why Me? ", although "Twist Of Fate" was a top 5 hit in 1983, it's an oft-forgotten song - and certainly not one you hear as much as Livvy's Grease or Xanadu singles. Co-written by Player singer Peter Beckett and Steve Kipner (who co-wrote ONJ's last top 5 single, "Physical"), the energetic pop tune was a change of pace for producer David Foster, who's better known for working on big ballads. For me, it's the best thing Olivia's ever released. It was certainly the best thing to come out of Two Of A Kind, a preposterous movie about a broke inventor (played by John Travolta) who robs a bank, in which ONJ's character works as a teller. With angels and God watching overhead, the fate of humanity depends on them... or something. Grease (or even Grease 2), it was not. 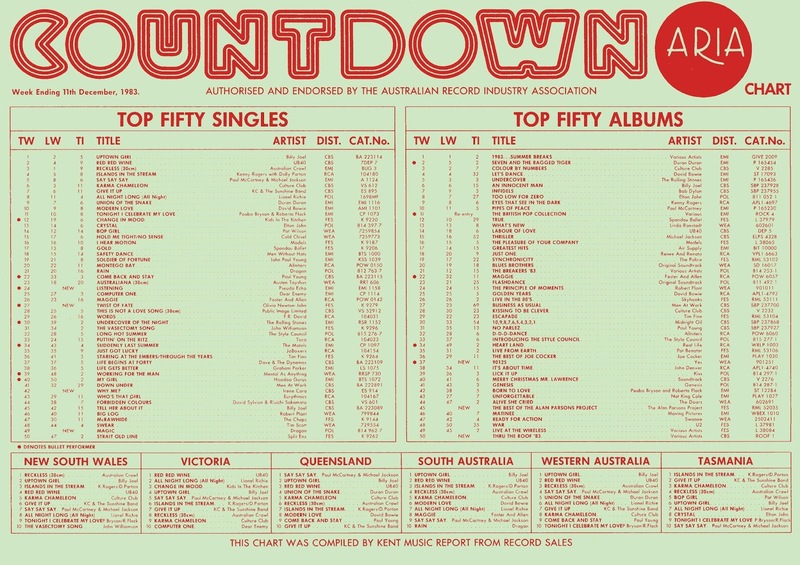 We hear a lot about all the acts that wouldn't have been as successful without the assistance of Molly Meldrum and Countdown - and here's Exhibit A: a band who weren't even signed when they first appeared on the ABC music program after being spot playing in Melbourne by Molly. So convinced was Countdown's talent coordinator in the potential of Pseudo Echo, named after a keyboard effect, and clearly influenced by the likes of Duran Duran and Spandau Ballet, that they performed a demo version of "Listening" on the show in mid-1983. A few months later, they'd been signed by EMI and released a re-swizzled version of the track as their debut single. Molly had been right on the money, with "Listening" providing the four-piece fronted by Brian Canham with the first of four top 10 hits. In this week's 30 Years Ago... post, we saw the debut of the fourth of those top 10 records, "Funky Town", which hit number 1 across summer '86-'87. Following the international success of the Lipps Inc remake in 1987, Pseudo Echo released a remix of "Listening" overseas, which was also included on the soundtrack to surfing film North Shore, but the song didn't take off as it had done here four years earlier. Next week: Australia's hottest band takes things to a whole new level with the debut of the song that'd end up as their biggest hit. Plus, possibly the best song named after the band that performed it. 'Total Eclipse', which I've never heard (of) before, is quite pleasant. I knew and liked 'Magic'. Surprising to see it peaked so low. I don't think I was aware of 'Why Me' until seeing it on a Countdown repeat several years ago. Interesting that Pseudo Echo performed unsigned on Countdown (who were into making their own studio 'music videos' in lieu of 'live' performances that year, it seems). I hadn't seen that 1987 video for it before. Twist of Fate and Why Me would have to be two of the most under rated songs to have made the top five in this country. How they don't bob up on radio even occasionally today is a travesty.